Last year's Fin Fang Four one-shot for Marvel was originally pitched as a four-issue series, which explains why the final book was pretty dense, plot-wise. 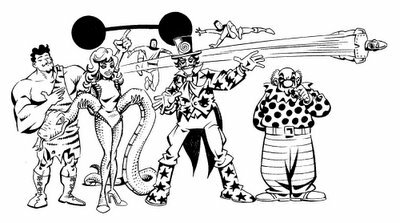 One of the things we had to throw out in order to bring the book in at 28 pages was a story involving The Ringmaster and his Circus of Crime, some of the cheesiest baddies to grace the Marvel Universe (which is why my co-writer Scott Gray and I wanted to use them, of course). This pencil rough was included in the original submission. I'd be quite happy to write an entire series around these guys. Loved all those Marvel Monsters one-shots, Roger, and I'm glad they're sticking them together into one of their lovely over-sized hardcovers. Glad you liked it. It seemed to get good reviews from kids and over-35s, and everyone else ignored it. (Which is fine, kids and over-35s have money too.) We're getting a pitch together for a follow-up miniseries, although there are so many hoops to jump through before it gets approved that I wouldn't hold my breath just yet.